AkzoNobel has announced the opening of a new technical center for wood coatings in Malmö, Sweden. The Amsterdam-based coatings giant says the new €2.5 million (about $2.7 million) facility is one of four global centers that work with customers to develop application systems to suit their specific manufacturing needs. AkzoNobel says the new center features experimental application equipment and showcases new wood coatings technology. The company announced the new center for its Wood Coatings business Thursday (Nov. 19). The center includes experimental equipment, cutting-edge application lines and temperature and humidity controlled spray booths, according to the company. 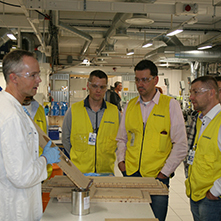 “The facility enables us to replicate our customers’ own manufacturing processes, making it easier to develop products and technologies that can be tailored to their specific application environments,” said Anthony Woods, Research, Development & Innovation director for AkzoNobel’s Wood Coatings business. Several of the company’s latest innovations are showcased at the center, such as AkzoNobel’s proprietary technique for applying edge coatings with millimeter precision, as well as the company’s automated system that scans wood for holes and cracks and automatically applies filler, the company noted. Moreover, the center also demonstrates UV-LED curing, a sustainable wood finishing technique which reportedly uses up to 30 percent less electricity than competing curing methods, AkzoNobel said.